Many people have blogged and commented about the random nature of connective knowledge. Going through some of the course material, and getting into the hyperlink-hopping mode certainly does lead to random connections. I somehow got to look at Stephen Downes' slideshow 'Toward a New Knowledge Society', in which this slide 14 with its Andy Warhol Marilyn pictures found its way into my dreams last night. Waking up this morning the Andy Warhol method of multiplying the same image over and over again with varying colours to create a piece of pop art made me think of all the blogs of this course. I have seen many summaries, mind maps, and other representations of this week's readings in different blogs. Basically, the content is the same, but it is presented in different forms. All these put together would create something remotely suggesting the idea of the Marilyn prints. I know, I know, this is vastly oversimplifying things - naturally each blogger or mind mapper has added their interpretations so it's not exactly the same as reproducing the same image in different colours. As far as my learning is concerned, I'm still struggling to find the significance of such a multitude of 'nodes in the network'. Possibly, just as Andy Warhol only used a certain number of Marilyn images to create the whole, out of the hundreds of blog posts on a particular theme, my job is to pick and choose the best ones / the ones that work for me. Nevertheless, I started reading about Andy Warhol in more detail, and naturally came across his famous quote from 1968: "In the future everybody will be world-famous for 15 minutes." (At this point I started worrying whether I should admit that I actually look for information in Wikipedia?? At least many of my colleagues at school don't usually accept it as reference in students' work.) This then led to the discovery of the latest adaption of this quote. Apparently the popularity of social networks and blogging has changed the quote into "On the Web, everyone will be famous for 15 people." Good, eh? I should check the validity of this statement during this course. I wouldn't actually talk about being famous, but making some connections - whether it will be min. 15 or not. But the randomness continues. The quote made me think of numbers and remember to look at the chart that Roy Hanfling had made about the course posts on Moodle, which then got me to learn about the power law diagram (pheww, this was a link to Wikipedia, so no worries any more!). By then, after getting sidetracked so many times I started feeling slightly guilty of not sticking to my resolution of focusing on the weekly readings. Luckily, Stephen Downes' comment to Roy Hanfling gave me some consolation. He said: "It is in the contributions of the long tail that the most interesting contributions may be found." So now I'm thinking of the great adventure that online learning can be. When before could we have explored so much, so easily by just clicking away from hyperlink to hyperlink, following every whim and instantly finding information? 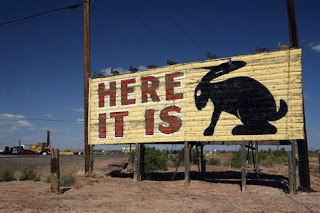 And just as my family's road trip across the US a decade ago revealed - it's worth venturing out to the less-trodden little sideroads for unpredictable and immemorable discoveries. This is such a thought-provoking post I don't know where to begin. Your analogy of the Warhol paintings of Marilyn is fantastic and I agree it definitely lends itself to the idea of interpretation of knowledge being dependent on an individual's circumstances and context. Actually taking this one step further, if we were to ask "which individual Marilyn image is the canon" it would make things even more interesting. The reality would perhaps be "none is; all are". As far as the multiplicity of nodes is concerned, I think the significance is that they enable us to make connections. Conceptually I may not be able to make an immediate connection with the entire principle of Thermodynamics but I can start to grapple with it piecemeal. What I'm able to connect with first will depend on my existing conditions and context. A node that's right next to me and I can clearly relate to will enable me to make a conceptual leap in understanding, which will then facilitate another, and another until eventually I've come to realise a far greater understanding of the subject that I possibly could have without the nodes present. You might say they act as a roadmap for learning perhaps. You spoke of the "random connections". In this context I wouldn't personally call them random - they're quite related in fact. They may be tangential to what you were originally trying to learn, but I can definitely see where quote conceptually lead to the chart, which lead to the power law diagram. Regarding Wikipedia, I use it as my starting point for most subjects. It's not the end all and be-all certainly, but I've found it can lead to some valuable connections and leads to other sources, which in turn lead to others. So we start to see the same node-hopping I mentioned earlier. You challenge me again, thank you so much for sharing your time and insights! I did indeed use the word 'random' incorrectly, or if you like, too colloquially for the register called for in this context. It's because I teach in high school and we Finns, especially the young ones, love to borrow English words, but sometimes alter their meaning. By describing something as 'random', my students usually mean that it is unusual, out of the ordinary, bizarre, or somehow out of context. (It's actually a very popular word among Finnish youth! I wonder if English speaking youngsters use this same meaning, too?) I realise now that I will need to pay more attention to being exact and more formal in my use of English. It doesn't seem to come naturally any more having been disconnected from academic discourse for some time. 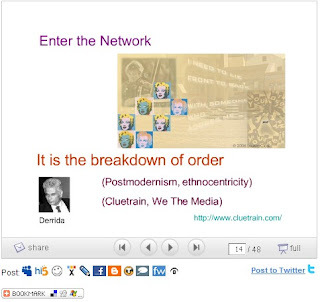 Coming back to my net surfing that day, I can see clearly how my connections between the 'nodes' resulted from associations that led to conscious decisions to follow a certain idea or train of thought, ie. nothing random in that. Could you think, though, that at the outset, the outcome of my learning and connections could be described as 'random', or maybe I should say unpredictable or coincidental? On second thoughts, is there anything 'random' about learning whatsoever?? I just got stuck with that word somehow having read it in many people's posts, but didn't reflect on it more deeply. You could be exposed to random information, couldn't you? But for you to get any connections between the 'nodes of information' to be able to start formulating knowledge or understanding, the process can't be random any more, can it? But if you remove the 'randomness' idea, I think my acoount of what I did that day helps me imagine how my students might go about learning on the net. Why should a teacher set too strict goals of what the students should learn and do, as they are bound to digress. Instead, if students were more often given the autonomy to learn by making their own connections, wouldn't it enhance their learning, or at least make it more fun, which isn't a bad idea either? But for now, I will leave any further discussion about curriculum and related issues till later. As for the Warhol picture. Good question about "which individual Marilyn image is the canon". As you, I would be tempted to say "none". Otherwise, wouldn't the "canon image" suffice on its own? And yes, I can see the value and importance in the multiplicity of nodes. The truth is that despite my conscious efforts to focus and select, frustration still builds at times. Your ideas about the gradual conceptual leaps from node to node somehow remind me of Vygotsky's concept of 'the zone of proximal development', in which learning is aided by collaborating with the teacher or more knowledgable peers. In this sense connectivism could be considered closely related to constructivism. I definitely connected with your "randomness", although as Mike indicated maybe not so much random as connected meanderings! I keep telling myself to focus on the readings...and keep meandering off on tangents - but like you I am enjoying it and I think I am learning heaps. I throughly enjoyed reading your blog and look forward to connecting with you again.